Karen Woodward: Are Libraries 'Sitting Close To Satan'? Do Publishers View Libraries As Their Adversary? Did you know that some publishers refuse to sell ebooks to libraries? Or that some publishers have made ebooks impossibly expensive for all but the best funded libraries to purchase? In publishers’ eyes librarians are “sitting close to Satan”, declared Phil Bradley, president of the Chartered Institute of Library and Information Professionals. He was addressing indignant librarians who recently gathered in London to swap tales of e-lending woe. Some publishers have refused to sell their e-books to public libraries, made them prohibitively costly or put severe restrictions on their use. Although 71% of British public libraries lend out e-books, 85% of e-book titles are not available in public libraries, according to Mr Bradley. In America the average public library makes available only 4,350 e-books (Amazon, an online retail giant, stocks more than 1.7m). If I go to the bookstore and buy a book, a physical book, something I can hold in my hands, under copyright law I'm allowed to lend that book out. We've all done this, we loan books out to friends as well as borrow them. But ebooks are different. When I buy an ebook from Amazon all I have bought is a license to use the book. Unless the author/publisher allows it I can't lend that book out. Under copyright law, anyone who buys a printed book can lend or rent it, but the same does not apply to digital works. Libraries do not own these outright. Instead they must negotiate licensing deals for each book they want to lend. They put the e-collections on servers run by computer firms such as OverDrive and 3M, which typically charge around $20,000 annually, plus a fee for each book. Also, publishers often limit the number of times a book can be lent out by a library before the licence has to be re-purchased (see: Publisher's fear of e-books is hurting libraries). I generally like to put a positive twist on my articles--I love happy endings!--but this particlar cloud seems to come without a silver lining. But we can make one. 5. The library can use it an any format they need; mobi, epub, pdf, lit, etc. And when new formats arise, they're free to convert it to the new format. That quotation is from: Ebooks For Libraries, a post which Joe Konrath made on August 29th of last year. Here's another post Joe made about the same topic: E-books in Libraries: They Still Don't Get It. Question: Would you offer any of your books to a library under Joe Konrath's terms? Thanks to The Passive Voice Blog for the link to the article in The Economist. 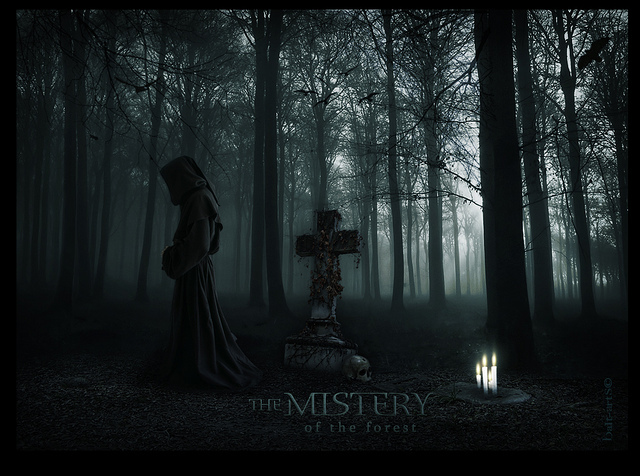 Photo credit: "Blend - Mistery of the forest - wallpaper - version 2" by balt-arts under Creative Commons Attribution-NoDerivs 2.0. I fully support libraries being able to lend out ebooks, but I don't know that I would say it should be under Joe Konrath's terms. I think there should be some small royalty for the author based on how often the ebook is borrowed. I admit I'm not sure how this would fit with existing library budgets -- but the Public Lending Right Program in Canada, for example, pays authors royalties for their books' use in libraries. I think there should be something similar when it comes to ebooks, perhaps with a cap on what libraries are responsible for paying out, or something. Because a physical book in a library eventually has to be replaced; and the more popular it is the more copies a library will buy. So I think it would be fair if the frequency with which an ebook is borrowed was reflected in income the author sees from it. "... the Public Lending Right Program in Canada, for example, pays authors royalties for their books' use in libraries." Yes! I heard of that. It helps out many authors. I know a poet who might not be able to keep going otherwise. "So I think it would be fair if the frequency with which an ebook is borrowed was reflected in income the author sees from it." I think Joe's headed in the right direction, but I would not accept any compensation from a public library. I would happily provide them with all ebook formats they desired, free of DRM, and without any restriction as to the number of lends. To me, it only makes sense given the purpose of the public library system, which is (unless something has changed I'm not aware of) to make books available for the public to borrow, free of charge. Good point! And I think having one's book in the library could be great advertising. Some authors are concerned that readers won't buy their books if they are available from the library, but Joe make a good case for the point that if the price of an ebook is moderate that folks are still going to download it from online retailers because it's more convenient. This is a very interesting article, thanks for sharing. I had no idea the cost of ebooks to libraries. I also didn't know about the Public Lending Right Program in Canada that David mentioned. It would help authors to get a small royalty every time their book is lent, but at the same time would the small libraries be able to afford that in the US? I'm not sure. By the way, about the Public Lending Right Program in Canada, I'm not sure if payments are made based on the number of times a book was lent out or just whether the book was found in a library and now old the book is.